Prince Félix and presumably Princess Claire (she might even be the person half hidden in the picture above) hosted the "French Legends", a group of former French professional rugby players coming together for charitable causes, at their Château les Crostes to benefit the organisation Le sourire de Lucie last night. Lucie, who celebrated her 20th birthday this weekend, suffers from Larsen syndrome, which is "a rare genetic disorder that has been associated with a wide variety of different symptoms. Characteristic findings of the disorder include dislocations of the large joints, skeletal malformations, and distinctive facial and limb features." The "French Legends", led by former French rugby union international Serge Betsen, were joined by rugby players from RC Toulon as well as local handball professionals for the evening. To raise money for Le sourire de Lucie, jerseys and other memorabilia were auction off. Also to benefit the charity, the Château les Crostes officially launched the new Cuvée Amalia, named for the baby daughter of Prince Félix and Princess Claire. One euro and fifty cents of every bottle sold of the rosé wine will go to support Le sourire de Lucie. To be perfectly honest with you, I was very tempted to title this post "Luxarazzi 101: Those earrings especially Maria Teresa and Stéphanie seem to be swapping back and forth an awful lot (and I'm not even sure what they are made of)" but alas that post title was a bit long. So, I'll simply call these the Small Amethyst Earrings (though I'm still not entirely sure what they are made of as the colouring does change quite a bit depending on the lighting). And while we may never learn what exactly the centre stone surrounded by small diamonds of this pair of earrings is, they still are making the rounds in the family. 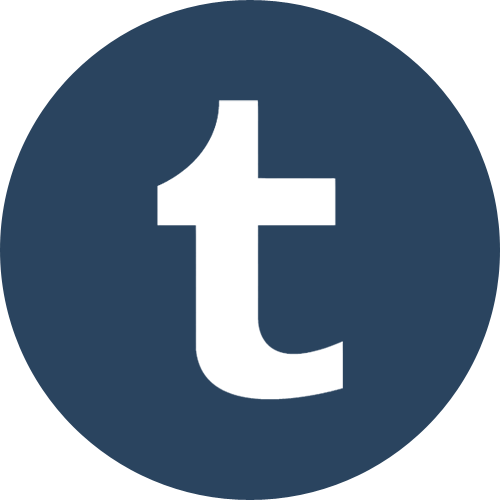 At least Grand Duchess Maria-Teresa, Princess Alexandra and Hereditary Grand Duchess Stéphanie have worn them in the past. 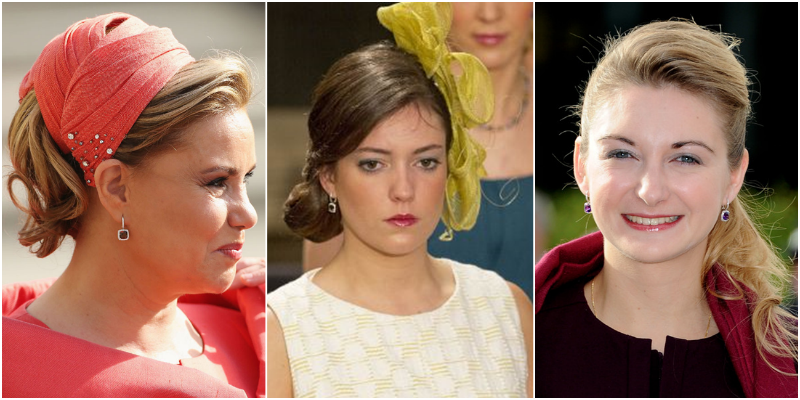 I haven't done maths or anything, but they might just be the most sported earrings of the Grand Ducal Family, worn by both Maria Teresa and Stéphanie on a very regular basis. 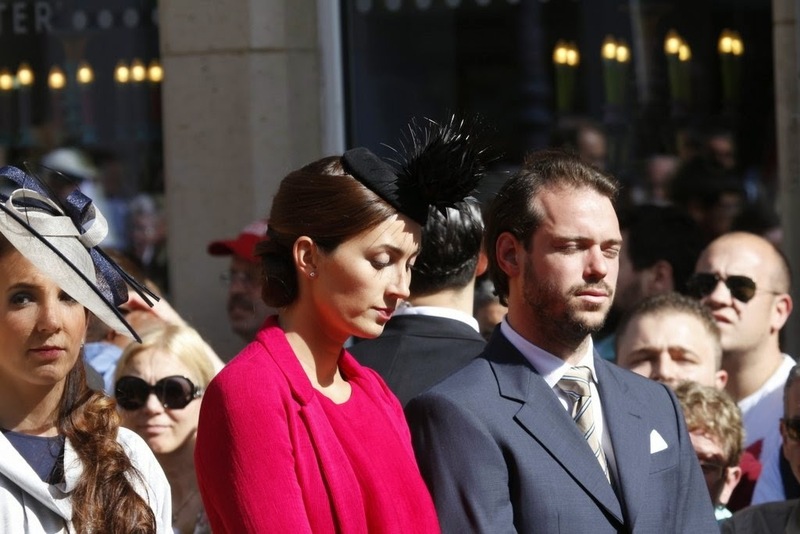 In fact they are so popular that the former Countess Stéphanie de Lannoy wore them on the day of her civil wedding for a reception (right) and Grand Duchess Maria Teresa a day later for the religious wedding (left). These days for most people Liechtenstein is a rather obscure tiny Principality somewhere between Austria and Switzerland (if they know it at all). 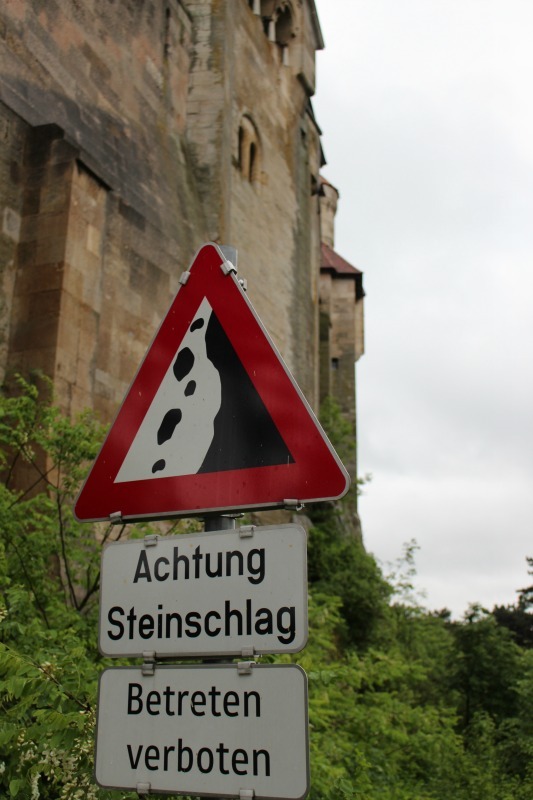 However, the territory now known as Liechtenstein hasn't always had this name. In fact, the Principality takes its name from the family that rules it, the House of Liechtenstein. On 23 January 1719, Emperor Karl VI issued a decree stating that the lordships of Vaduz and Schellenberg were to be united and elevated to the dignity of principality with the name "Liechtenstein" in honour of "[his] true servant, Anton Florian of Liechtenstein". The roots of Princely Family thus do not lie in the Principality now bearing their name but instead in Austria, south of Vienna to be exact. In the town of Maria Enzersdorf, you can still find Burg Liechtenstein, the family's ancestral home. Literally "bright stone castle", it is just one of many castles and palaces still owned by the Liechtenstein family in Austria. Some of them I visited during my recent stay in Vienna, which you might well be aware of when you also follow my other blog, Castles & Co.
For today's post here on Luxarazzi, I will chronicle all my visits to the Liechtenstein sights during my Viennese adventures starting with the Burg Liechtenstein. As I visited rather late in the day when coming back from a daytrip to the Wachau region, the castle was already closed for visitors. However, it was still nice to see the ancestral home of a family I have learned so much about (and continue to learn even more about) for the past few years. The Burg Liechtenstein, just as about every other building covered in this post, has recently been extensively renovated by the Princely Family and got a new roof, for example. However, it remains a seriously old building dating back to the 12th century and as such you are not allowed to walk along one of the castle's sides due to the danger of falling rocks. Opposite the Burg lies the Schloss Liechtenstein. Originally a manor and farmyard, it was rebuilt as a summer residence by Prince Johann I of Liechtenstein between 1820 and 1821. These days, it is a (probably rather posh) retirement home. 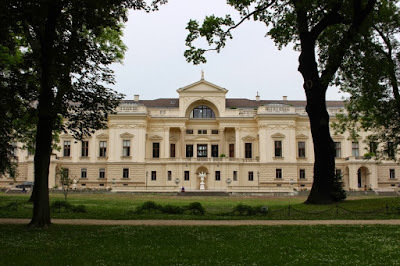 Onto one of the places I actually visited the inside of, the Gartenpalais Liechtenstein in Vienna's Alsergrund distict. And well, even after seeing it in person, I think it's still my favourite of all Liechtenstein palaces. It's located in a rather small but lovely park combining both French and English aspects of landscape architecture. Too bad it was never intended to be a place to live but instead one to partey. Not that I don't mind a good party but I just think it would be a rather nice place to live. Visiting the Gartenpalais was also quite an experience. Earlier in the day, I had been to Schloss Schönbrunn and I don't think I had ever seen so many tourists in my entire life trying to squeeze themselves into one room during a tour. This was the absolute opposite. Sure, it's a little more expansive but you are even welcomed with a glass of bubbly! Plus, there are lots of nice things to see, like the Golden Carriage of Prince Joseph Wenzel I in the Sala Terrena. Many of the rooms also include pieces from the Princely Collection of the House of Liechtenstein though you are understandably not allowed to take pictures of those. ...so you could - in theory - live there but I guess that the practical things, like the money to be able to afford it, would let those plans fail miserably. Also located nearby and visitable for free is the parish church of Lichtental. 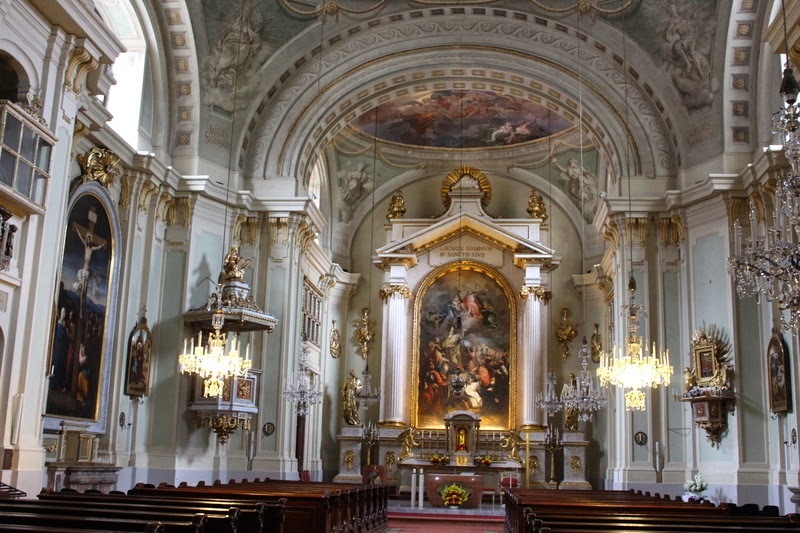 It's the patron church of the Princely Family, which is also quite famous for being the place of baptism of composer Franz Schubert. ...one of the first signs that something special awaits you might just be the princely coat of arms inset in the street lamp. 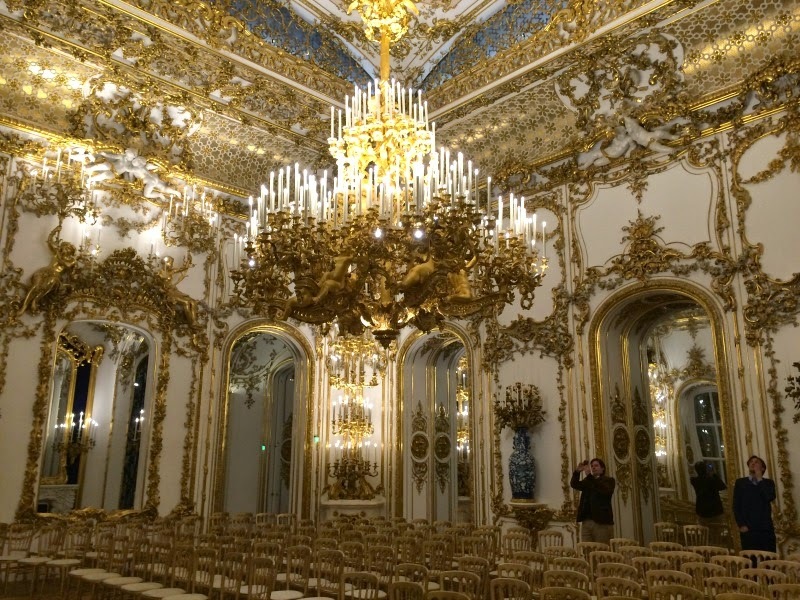 Et voilà: Gold, gold, and more gold in the palace's grand hall. Legend has it that even Prince Alois II of Liechtenstein (1796-1858) thought that there was just a little too much gold in this room. And so the putti in the room's corners aren't gilded in an attempt to have just a little less gold in the room. Today's 11th Gottfried von Haberler Conference in Vaduz brought out our usual suspects of Haberler conference attenders (is that even a word? 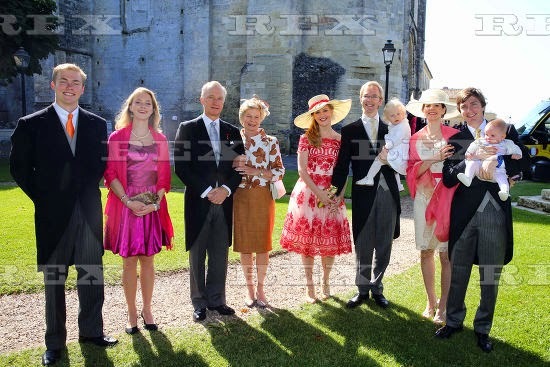 ), Prince Philipp and Prince Michael, father of the Liechtenstein princess at the Neipperg/Limburg-Stirum wedding. This year's conference, which was entitled "Be embraced, you Millions? 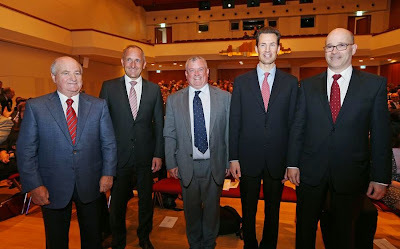 The stranglehold of big states", took place at the University of Liechtenstein and counted former Czech president Václav Klaus and the current Liechtenstein Deputy Prime Minister Thomas Zwiefelhofer among its speakers. 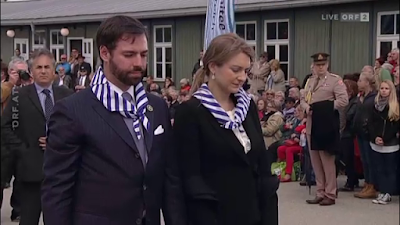 I wouldn't be too shocked to hear that Prince Hans-Adam, Prince Nikolaus and Prince Stefan were also in attendance considering that they have been in the past. In any case, Hereditary Prince Alois hosted all the participants for a cocktail reception at Schloss Vaduz this evening. 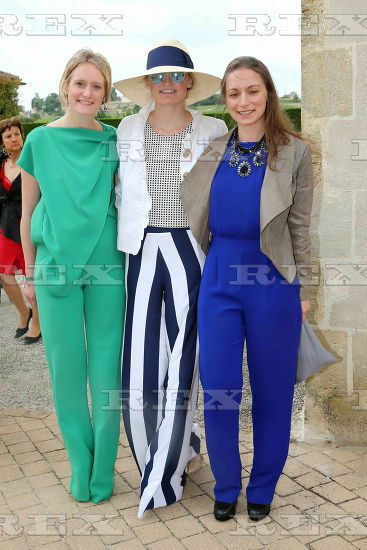 Again, I wouldn't be shocked to hear that Hereditary Princess Sophie was also present. For a video of today's conference including an interview with Prince Michael, head over to 1 FL TV. Yesterday, the Hilti AG opened a new innovation centre for 116 million euro in Schaan, Liechtenstein's biggest municipality. Hilti is a Liechtenstein company that develops, manufactures and markets products for the construction, building maintenance and mining industries, primarily to the professional end-user, with more than 20,000 employees all over the world. It is also the biggest employer in the Principality and unsurprisingly the Fürst himself was present for the opening. Prince Hans-Adam was joined by Deputy Prime Minister Thomas Zwiefelhofer. While we are still (im)patiently waiting for more pictures of last weekend's wedding of Countess Caroline von Neipperg and Count Philippe de Limburg-Stirum to come up - no article in this week's Point de Vue, three pages in Bunte but just one new picture (of Prince Philipp and Princess Elisabeth von der Leyen) - here's another Liechtenstein face who rarely makes it onto this blog: Princess Gisela of Liechtenstein, daughter of the occasionally featured Prince Michael, in blue in the picture on the right together with Princess Xenia of Croÿ, great-granddaughter of Princess Antonia of Luxembourg, and Countess Maximiliana of Arco-Zinneberg showing us that jumpsuits must be *the* go-to thing at this summer's noble weddings. In some non-jumpsuity news and to clear up some occasional confusion: The people described by photo agencies as "Marike Stine von Habsburg and Rudolf von Limburg" are in fact Countess Fanny of Khevenhüller-Metsch and Count Damiano Minozzi. Also spotted among the about 450 wedding guests: Jean-Christophe de Lantsheere, Count Alexis de Warren and Count François du Chastel (thanks to you know who you are). The church service of the noble wedding was led by Paul von Habsburg. 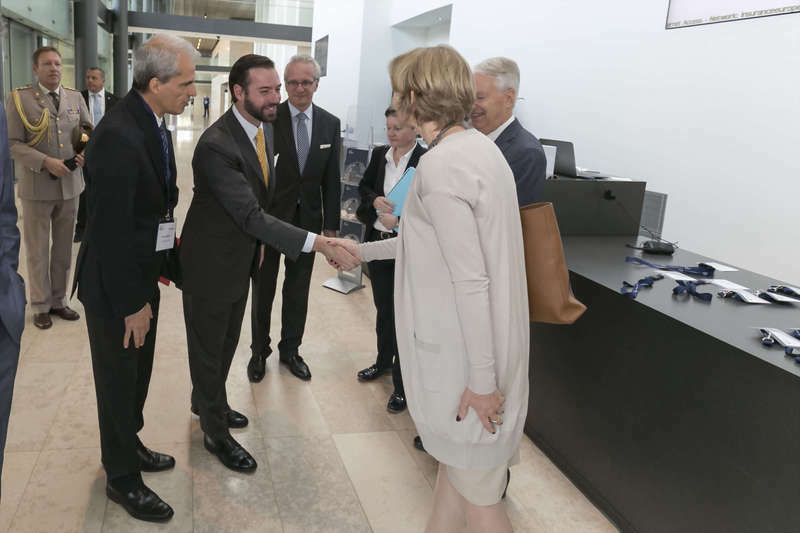 Insurance Europe held their 7th International Insurance Conference in the Grand Duchy in the presence of Hereditary Grand Duke Guillaume yesterday. The main theme of this year's conference was the globalisation of the insurance industry. About 400 insurance industry leaders from all over Europe and the world gathered for the event at the Kirchberg conference centre, which was opened by the Minister of Finance, Pierre Gramegna. More pictures of the day on the cour's website. 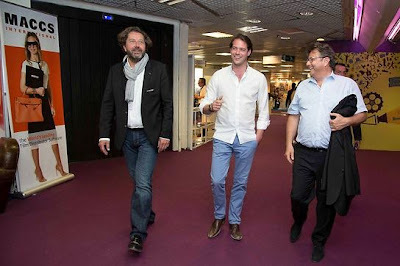 Prince Félix recently visited Norway to promote his wines. On April 21, he was among the seven Provencal wine producers, as well as the Biscuiterie de Provence and soap producer Marius Fabre who presented their products at the French ambassador's residence in Oslo. The tasting was jointly organised by UbiFrance and Comité Mistral. First off, the producers hosted a 'master class' at the Culinary Academy of Oslo where two French chefs, Mr. Charial and Mr. Chibois, prepared the food and the producers where able to showcase their variety of wines. Afterwards, the French ambassador to Norway, Jean-Marc Rives (pictured with Félix on the right), gave the producers the chance to present their wines at the French embassy. A few more pictures at UbiFrance. On Whit Sunday, Prince Hans-Adam II and Princess Marie were among the listeners of a concert by the church choir of Vaduz's St. Florin Cathedral in cooperation with the ensemble Raetiana, a few soloists as well as organist Maciej Zborowski. 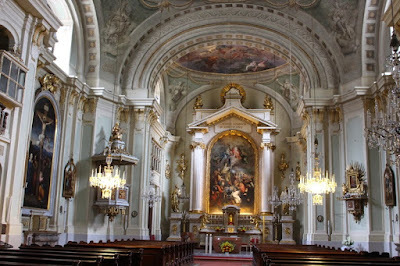 They performed the "St. Cassians Messe" by Joseph Gregor Zangl (1821–1897) interspersed with a bit of Vivaldi, Händel and more. 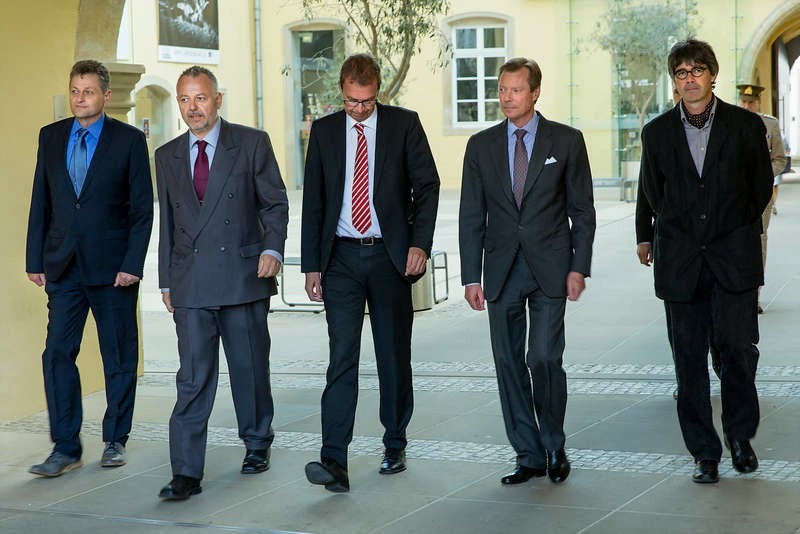 Ambassadors reloaded: While Grand Duke Henri recently bit farewell to one, Hereditary Prince Alois welcomed a new ambassadors from Serbia on Friday. In an audience, Snezana Jankovic presented her letter of credence to Liechtenstein's regent. As I wrote before today: When an ambassador commences their service in Luxembourg Liechtenstein, he or she is received by the Grand Duke Hereditary Prince at a formal audience to present their letters of credence. Similarly, when the ambassador is to return home, a similar meeting, albeit somewhat less formal, takes place. Last night, Hereditary Grand Duchess Stéphanie was back in her native Belgium where she attended the Concours Reine Elisabeth alongside Queen Mathilde of the Belgians in Brussels. The Concours musical international Reine-Élisabeth-de-Belgique, as it is its full name, is an annual music competition taking place at the Palais des Beaux-Arts in Brussels. 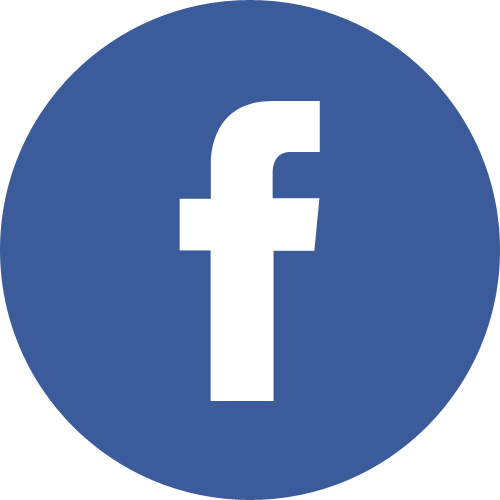 It is a founding member of the World Federation of International Music Competitions and is considered to be one of the most prestigious and most difficult. Luxembourgish royals are no strangers to the event as the Grand Duke's sisters, Archduchess Marie-Astrid and Princess Margaretha, regularly accompanied their late aunt Queen Fabiola to the event over the years. Pictures of Stéphanie and Mathilde from this year on Place Royale's Facebook and at The World of Royals. Grand Duke Henri received in audience on Thursday, May 21, Madame Eva Descarrega Garcia, outgoing ambassador extraordinary and plenipotentiary of Andorra, to bit her farewell. 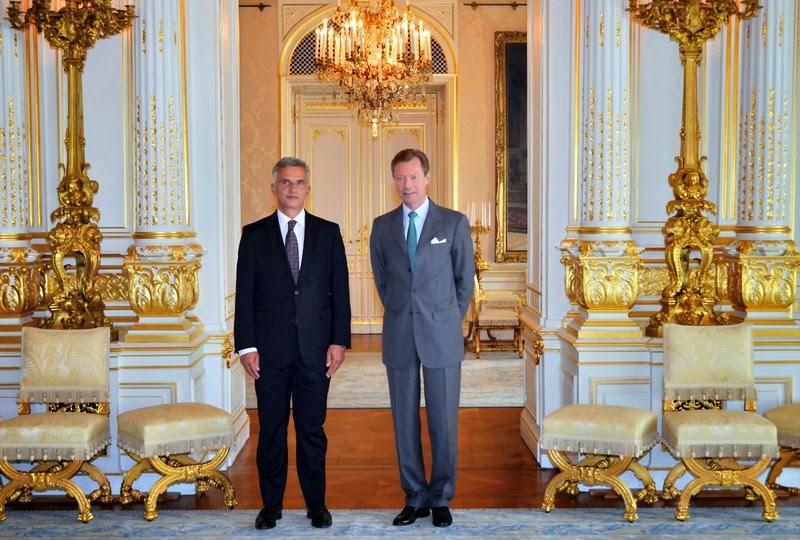 When an ambassador commences their service in Luxembourg, he or she is received by the Grand Duke at a formal audience to present their letters of credence. Similarly, when the ambassador is to return home, a similar meeting, albeit somewhat less formal, takes place. 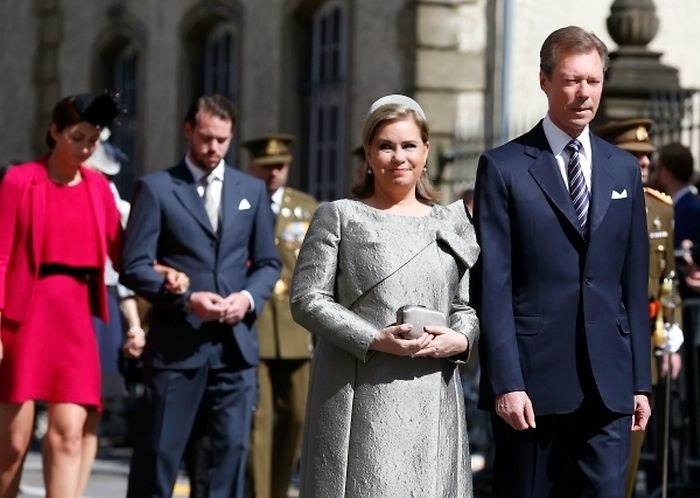 Back to last weekend's noble wedding of Countess Caroline von Neipperg and Count Philippe de Limburg-Stirum: A few new pictures have come up showing us that our Luxembourgish Habsburgs were out in quite a force. From left to right: Archduke Alexander, Archduchess Gabriella, Archduke Carl-Christian and Archduchess Marie-Astrid (wearing what I believe is another one of her mother's outfits, I'll get back to you about it), Archduchess Kathleen and Archduke Imre with their daughter Maria-Stella, as well as Archduchess Adélaïde and Archduke Christoph with their daughter Katarina. Other guests with Luxembourgish ancestors at the wedding included Princess Xenia of Croÿ and Prince Ludwig of Bavaria, great-grandchildren of Princess Antonia, as well as Princess Theresa d'Orléans (née von Einsiedel), great-granddaugther of Princess Elisabeth, just like Antonia a sister of Grand Duchess Charlotte. Prince Jean, Duke of Vendôme celebrated his 50th birthday on May 19. This past weekend the son of the Orléanist claimant to the French throne had a party in Dreux in northern France. Among the guests for the party were Prince Guillaume and Princess Sibilla from Luxembourg, as well as Prince Gundakar and Princess Marie of Liechtenstein, a born Orléans princess and sister of the birthday boy, with their daughters Princess Leopoldine and Princess Maria-Immaculata. Pictures of the party at Noblesse & Royautés. 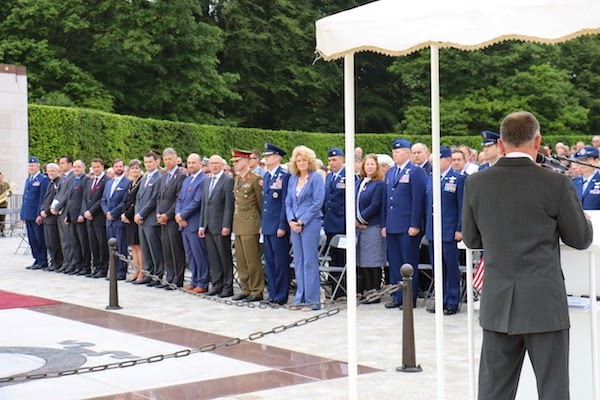 On Saturday, May 23rd, Hereditary Grand Duke Guillaume attended the annual Memorial Day ceremony at the Luxembourg American Military Cemetery and Memorial. The event was organized jointly by the U.S. Embassy in Luxembourg and the American Battle Monuments Commission. Also in attendance were Prime Minister Xavier Bettel, Deputy Prime Minister (and Minister of Defense) Etienne Schneider, Commander of the Luxembourg Army Romain Mancinelli, among other dignitaries from Luxembourg and the United States. The ceremony was also open to the public and began with an F-16 flyover followed by speeches from both Luxembourgish and American dignitaries. Some more photos of the event (although no more of Hereditary Grand Duke Guillaume, unfortunately) at Chronicle.lu, courtesy of the US Embassy in Luxembourg. Update: Additionally, you can find a few more visuals at the cour. Yesterday, Countess Caroline of Neipperg and Count Philippe of Limburg-Stirum married in a religious ceremony in Saint-Émilion in south-western France where her family owns a wine estate. 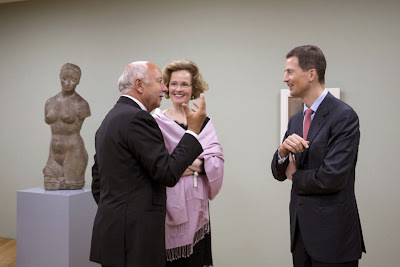 Philippe is the brother of Count Rodolphe de Limburg-Stirum, the son-in-law of Luxembourg's Princess Marie-Astrid. A few pictures of the nuptials can be found at Atlantico Press. Eagle-eyed me spied Archduke Imre and Archduchess Kathleen (first picture above, on the right) and Archduke Christoph and Archduchess Adelaide with their baby daughter Katarina (same picture above, on the left) in the pictures. One of the bridal children was Count Léopold of Limburg-Stirum, son of aforementioned Count Rodolphe and Archduchess Marie-Christine. I believe that it is also Marie-Christine from behind in the second picture considering she is holding Léopold's hand. I expect there to have been more members of the Luxo-Liechtenstein family in attendance but sadly there aren't very many pictures of the guests. Stay tuned, we will let you know if anything else pops up. 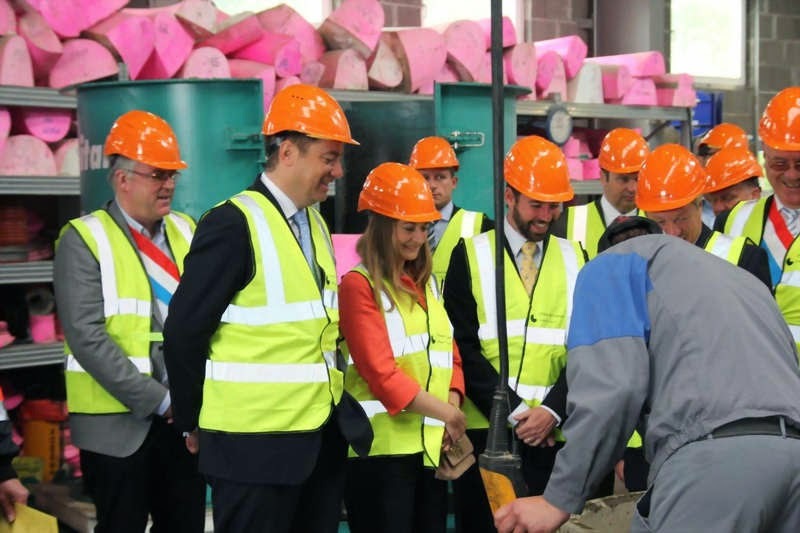 On Wednesday, Grand Duke Henri attended a selection of workshops focused on the protection of water resources in Luxembourg. Each presentation demonstrated the different methods that farmers and others in the agricultural industry are using to make the most of current water resources and reduce pollution. At the end of the visit, Grand Duke Henri toured a farm. Also in attendance was Fernand Etgen, the Minister of Agriculture, Viticulture and Consumer Protection in Luxembourg. The workshop presentations included members of the Chamber of Agriculture, the Parc Naturel de la Haute-Sûre (Naturpark Uewersauer), the Syndicat des Eaux du Barrage d'Esch-sur-Sûre (SEBES), and the Administration des services techniques de l'agriculture (ASTA). Additionally, students from the Lycée Technique Agricole in Ettelbruck explained how water resources protection is currently a part of their educational program. Some more photos at the Cour website and at Tageblatt. 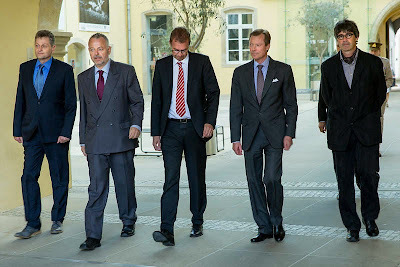 Grand Duke Henri was at Villa Pauly today to visit the exhibition "Between Shade and Darkness," which focuses on the Nazi oppression of the Jewish community in Luxembourg. 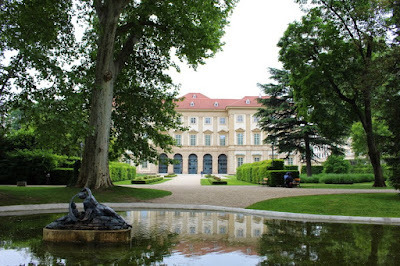 Villa Pauly, built in 1923 by Dr. Norbert Pauly, was the Gestapo headquarters in Luxembourg between 1940 and 1944, and the cellar of the building is particularly notorious as the site of interrogation and torture. Today, the house is the seat of the Comité directeur pour le Souvenir de la Résistance. A few more photos at the Cour website. 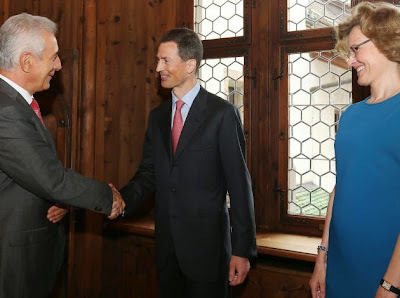 At Vaduz Castle, Hereditary Prince Alois and Hereditary Princess Sophie met with Stanislaw Tillich, the Minister-President of Saxony, who is visiting Liechtenstein from May 18th to May 20th. 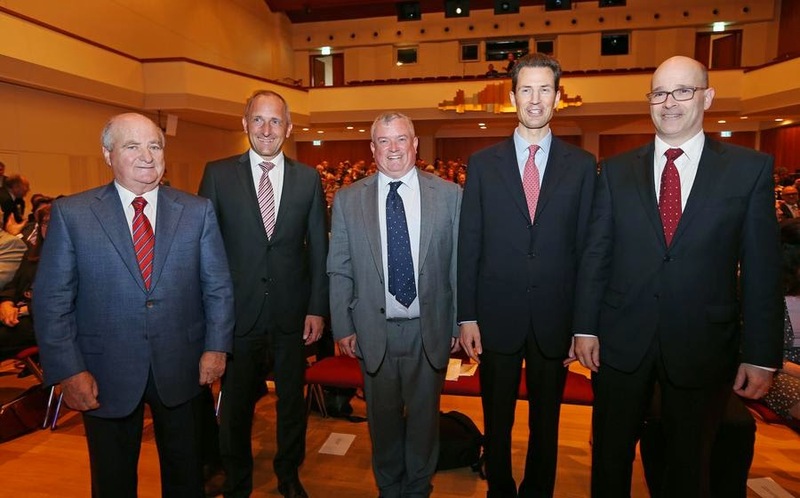 Minister-President Tillich also visited the University of Liechtenstein for joint talks on the relationship between education and business in both Liechtenstein and Saxony. 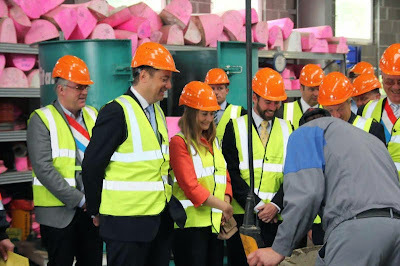 Alois and Sophie conducted an official visit to Saxony in May of last year: Day 1 and Day 2. More information about the Minister-President's visit here and here. Today, Grand Duke Henri visited the ongoing rehabilitation site for Luxembourg's famed Pont Adolphe, or Adolphe Bridge (and also called the "New Bridge" to separate it from the Passerelle, which is the "Old Bridge"). 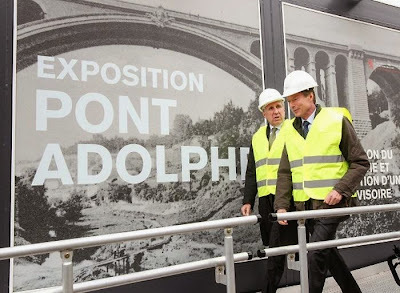 The Pont Adolphe, originally constructed at the beginning of the 20th century, is currently undergoing improvements that are also part of the bigger LuxTram project. The bridge rehabilitation is expected to be completed in 2017. 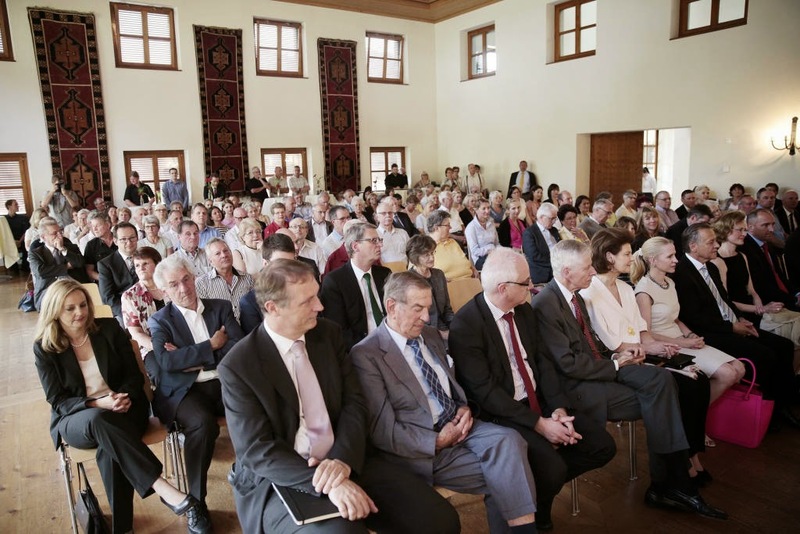 Grand Duke Henri accompanied François Bausch, the Minister of Sustainable Development and Infrastructures, for this event, which included a presentation. Some more photos, with a few more details about the bridge and the updates being made to it, available at Wort. 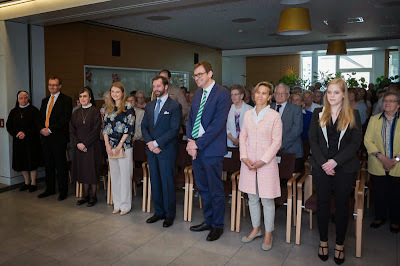 Today, Hereditary Grand Duke Guillaume and Hereditary Grand Duchess Stéphanie visited the Sacré-Coeur home for the elderly in Luxembourg city to assist at a concert given by the Trio Vivace, which is composed of three musicians of the Orchestre Philharmonique du Luxembourg (OPL). The concert was organised by the Fondation Ecouter pour Mieux s’Entendre (EME), or Listen to Better Understand. You might recall that Guillaume and Stéphanie previously visited a concert supported by the organisation in December of last year. They also donated 10,000 euros of the money they were gifted for their wedding to the Fondation Ecouter pour Mieux s’Entendre. No pictures as of yet but will be added if made available. Pictures are now available on the cour's website. Those following me on Twitter @SydneyLux already know what this is about: I'll be heading to Vienna this week for a much longed and looked for vacation. 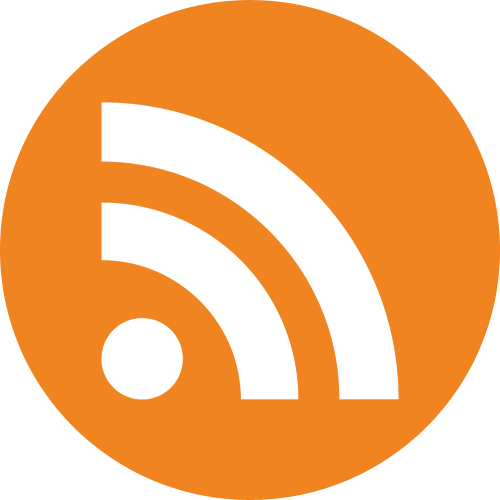 (Don't worry, life at Luxarazzi will still go on thanks to my awesome fellow bloggers!) 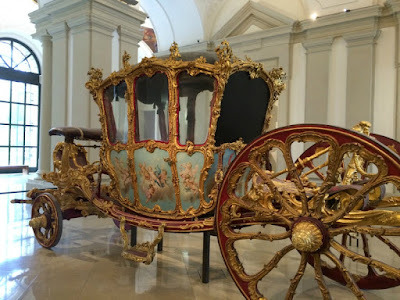 I have decided to chronicle my Viennese adventures over on my other blog, Castles & Co, in a little picture-heavy but likely text poor travel diary. * So if you care to join me on my tour of Vienna (and probably some nearby sights), head over to Castles & Co in the coming days! * How often and how long my updates will be largely depend on the time I find and how good the WiFi in my hotel is. Prince Robert: "Luxembourg Is A Very Friendly Place to Visit"
Prince Robert, the Grand Duke's cousin, gave an interview to wine-searcher.com about travelling the world, philosophy, the wine business and his short career as a screenwriter. Asked about what he would recommend someone visiting Luxembourg to do there he says, "I have not lived in Luxembourg since I was 11 years old but I do visit. It has a fine art scene and new museums. There are beautiful old castles and landscapes. And we have decent wine along the Mosel River, some very nice Rieslings. I grew up with those wines and I like them a lot. And it is a very down to earth place. The people are humble and it is a very friendly place to visit." To read the full interview, have a look here. On Wednesday evening, Grand Duke Henri and Grand Duchess Maria Teresa attended a screening of Kapus Kondyati Goshta (translated An Unending Story), as part of the 6th Cinéma du Sud film festival. The Oscar-nominated film tells the story of four orphaned sisters in rural India who face many challenges of being female, and alone, in their traditional village. The event has been organized by Save the Children India, Terre des Hommes Luxembourg, and Kindernothilfe Luxembourg. Following the film screening, Grand Duke Henri and Grand Duchess Maria Teresa attended a presentation by the organization Femmes en détresse, as well as a public debate. On Monday, Grand Duchess Maria Teresa spoke to students at the at the Athénée de Luxembourg. The school has been an UNESCO Associated School since 2004. 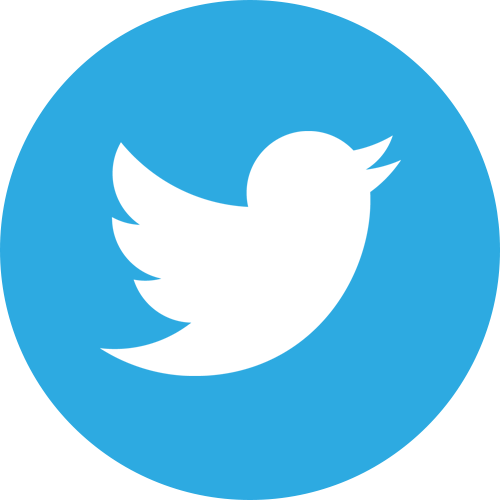 Member schools work to promote peace, international dialogue, and sustainable development. The students gave a presentation about the work of the association and their own project Peace at Athénée de Luxembourg. The Grand Duchess, who has been a Goodwill Ambassador for UNESCO since 1997, shared her personal experiences and participated in a forum that allowed students to ask questions. Additional photos of the even can be found at the website of the Cour. On Monday the Grand Duke received Didier Burkhalter at the palais grand ducal. Mr. Burkhalter is Federal Councillor and Head of the Federal Department of Foreign Affairs of the Swiss Confederation. He was on a working visit to Luxembourg. This weekend, Princess Sibilla likely visited Brescia, Italy. I say likely because I haven't actually found photographic evidence that she attended the 2015 edition of the Luigi Micheletti Award. However as she attended in 2011, 2012, 2013 as well as 2014 and was also mentioned in advance, she likely did again this year. The Micheletti Award is a prize for innovation in museums and was awarded this year to the National Archives of The Netherlands. Today in Kirchberg, Grand Duchess Maria Teresa attended the opening ceremony for the Congrès Infirmier National 2015. She was accompanied by the Minister of Health, Lydia Mutsch. The event, which is being held at the University of Luxembourg, also included a round table discussion entitled "The elderly person in the Luxembourg health system" and led by Professor Jean Paul Lehners who is a Professor of Global History and the UNESCO Chair in Human Rights at the University of Luxembourg. The Congrès Infirmier National 2015 is organized in connection with the Association Nationale des Infirmiers et Infirmières Luxembourg (ANIL), of which Grand Duchess Maria Teresa has been a patron since 1991. Additionally, the Grand Duchess has been a Goodwill Ambassador for UNESCO since 1997. No photos at present. They'll be added if they're made available. 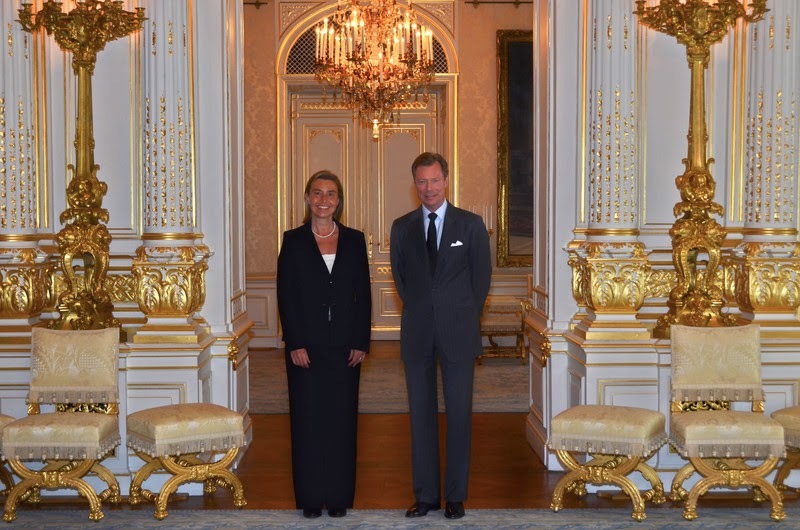 This afternoon at the Palais grand-ducal, Grand Duke Henri received in audience Federica Mogherini, who is the High Representative of the European Union for Foreign Affairs and Security Policy and the Vice-President of the European Commission. Madame Mogherini is currently on a working visit to Luxembourg. Today is the fifth Sunday after Easter and so it was time once again for the annual closing procession of the Octave of Our Lady of Luxembourg, Maria Mater Jesu, Consolatrix Afflictorum, Patrona Civitatis et Patriae Luxemburgensis or "Mary, Mother Jesus, Consoler of the Afflicted, Patroness of the City and Country of Luxembourg" in case your Latin has left you a little today. 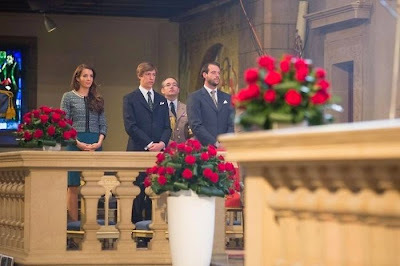 The Grand Ducal Family always makes it a priority to attend and so they did today. Already this morning, Grand Duchess Maria-Teresa, Prince Félix, Princess Claire, Prince Louis and Princess Tessy attended a pontificial mass. In the afternoon, they were joined by Grand Duke Henri (fresh off his quick trip to the United States), Prince Gabriel and Prince Noah for the closing procession leading them from the Cathédrale de Notre Dame de Luxembourg via the rue Notre-Dame, the rue Philippe II, the avenue de la Porte-Neuve, the rue Beaumont, the rue des Capucins, the Grand-rue, the rue du Marché-aux-Herbes in front of the palais grand ducal, where they stopped for the Eucharistic blessings, and the rue de l’Eau back to the cathedral. After the end of the procession and a concluding mass at the Cathédrale, the Grand Ducal Family traditionally makes their only balcony appearance of the year, bringing out a very special family member this year: Princess Amalia. 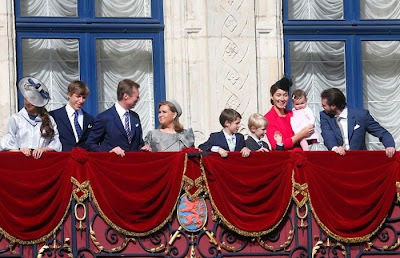 The ten-months-old baby daughter of Prince Félix and Princess Claire joined her parents, grandparents, aunt, uncle and cousins to hear the Harmonie Municipale de Luxembourg-Limpertsberg play some march, the national anthem and wave to the crowd. RTL has a news report about the day as well as pictures. Some more pictures at Wort. Today, Hereditary Grand Duke Guillaume and Hereditary Grand Duchess Stéphanie were in Austria to commemorate the 70th anniversary of the liberation of Mauthausen concentration camp, which consisted of a number of camps around the villages of Mauthausen and Gusen in Upper Austria near Linz. The camp was liberated on May 5, 1945 by American troops and thus the last concentration camp to be liberated. 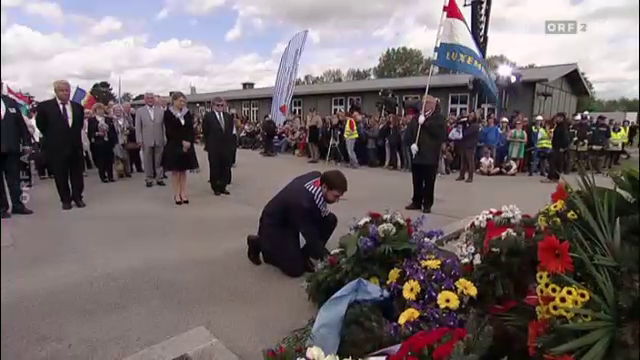 The couple laid a wreath at the Luxembourg memorial, which remembers the 176 Luxembourgish citizens who were deported to the camp between 1938 and 1945. Of these, 60 were killed almost immediately or soon after deportation. The two main camps of Mauthausen concentration camp complex, Mauthausen itself and Gusen I, were intended for those identified as "incorrigible political enemies of the Reich" and as such was designed largely for extermination by intense labour. The "incorrigible political enemies" were ofted selected from among the educated and from the upper social classes of Nazi-invaded countries. In the case of Luxembourg, many of the prisoners at Mauthausen had been members of the Resistance. 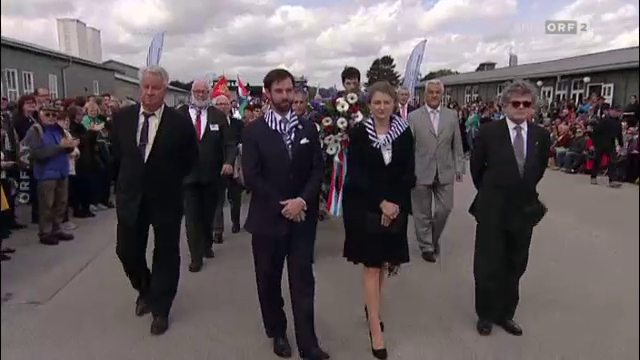 After the wreath-laying, Guillaume and Stéphanie attended the official program to mark liberation of the camp leading the Luxembourgish delegation. The liberation celebration was attended by 22,000 survivors, their relatives, local school children, as well as national and international dignitaries. 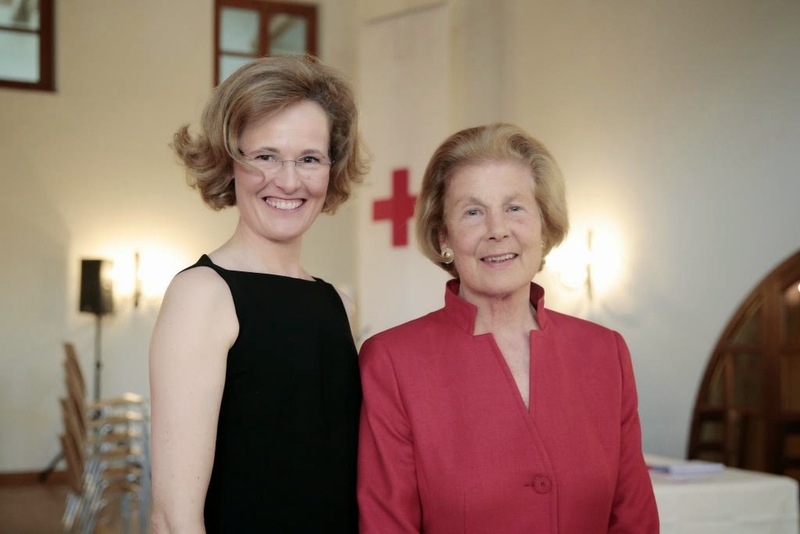 The Principality of Liechtenstein was represented in the person of Maria-Pia Kothbauer, Princess of Liechtenstein, the country's ambassador to Austria. 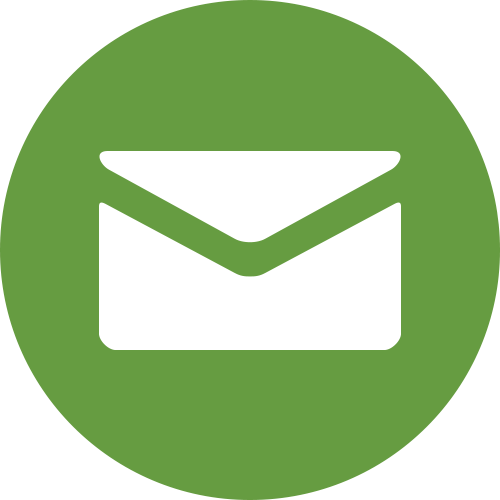 More information on the website of the Mauthausen committee. Grand Duke Henri and Grand Duchess Maria Teresa also visited the concentration camp during their 2013 state visit to Austria. A video of the commemorations today can be found at ORF, Tageblatt has pictures. A student by the name of Sébastien de Luxembourg - better known to us as Prince Sébastien - graduated from the Franciscan University of Steubenville today. Skip ahead to the 1 hour 12 minutes 48 seconds mark of the following video to see him take centre stage during the university's Undergraduate Commencement 2015. Present to give his son a big hug after Prince Sébastien received his associate arts degree was Grand Duke Henri. According to information previously released by the cour, Prince Sébastien studied marketing and communications at the Catholic university located in Ohio, United States. Grand Duke Henri also gave the commencement speech during the gradute commencement earlier in the day. Together with his wife, who wasn't present in person as she stayed in Luxembourg to represent the family at the Octave celebrations tomorrow, he received honorary doctorates in Christian Ethics for their conviction in favor of a culture of life. More once actual pictures and possibly information is released by the cour - hopefully, at least. Until then, a major thank you to The Royal Correspondent for pointing me in the direction of the video by telling me that there would be a livestream of the whole thing. Merci and good night (that's the plan at least)!